Because of large-scale decommissioning of surface ships and submarines, in 90's Russian Navy lost more ships that in World War II. Why that happened and what's the present status of the Navy? On April 1 [All Fool's Day] Interfax news agency reported referring to source in Black Sea Fleet HQ that large ASW ship Ochakov and diesel submarine B-380 Svyatoi Kniaz Georgy were prepared for decommission; same perspective was planned for large ASW ship Kerch, hospital ship Yenisei, ocean-going transport Turgai, cable ship Setun and ocean-going arms transport General Riabikov. In the source's view, the ships are old and obsolete. There's nobody to repair them and there's no money for that either: in 2010 financing of ship repairs at BSF is reduced by one third so the fleet yards are almost idle. Since Feb 2010 the staff of 13th and 91st ship-repair yards has been reduced almost twice. Commission of new ships into Black Sea Fleet is not planned in 2010. After decommission of Ochakov and Kerch, Black Sea Fleet will have only one 1st rank ship – missile cruiser Moskva, the flagship. The fleet has another "only" vessel in service – the only mission capable submarine Alrosa. According to public-open sources, during reorganization 629 Russian warships were decommissioned and sold for scrap only within the period of 1991-1997. Compare, during World War II Soviet Union lost 365 ships and submarines. In 90's Russia was seized by epidemic privatization, Army and Navy were short of budgetary money and were thrown upon their own resources. In conditions of young Russian democracy [sometimes interpreted like impunity and permissiveness] Navy command took any means to raise money. Ship decommissioning was conducted with gross breach of order. First, frequently decommissions were groundless. 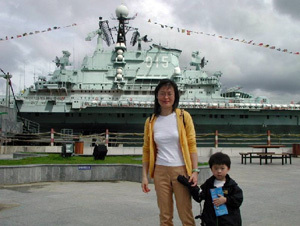 The shining examples are aircraft carriers Minsk (had been in service for 15 years, refitted into Minsk World military theme park in Shenzhen, China) and Novorossiysk (had been in service for 11 years). Smaller ships were also decommissioned ahead of reasonable time. For instance, Project 1134B large ASW ship Tashkent, Project 1155 large ASW ship Admiral Zakharov. Formerly menacing Pacific Fleet suffered the most; during silent decommission campaign PF sold for scrap 136 ships which could be in service for a long time. Strength of disbanded crews numbered 15,207 men, including 2,266 officers. Second, according to some naval experts, a good few ships were sold below market. In addition, sometimes reality differed from documentation and came to absurd: documents for one vessel covered selling of several ships. Example, in 1994 under the guise of Project 861 small reconnaissance ship Ilmen were sold following: nine landing ships (Project 1171 large landing craft – 3, Project 775 large landing craft – 5, Project 771 small landing craft – 1), four frigates (Project 1135 frigate – 1, Project 159 frigate – 3), three small ASW ships (Project 1124 small ASW ship – 2, Project 204 small ASW ship – 1), three sea-going minesweepers (Project 254 sea-going minesweeper – 2, Project 266 sea-going minesweeper – 1), one Project 1234 small missile ship, six submarines (Project 641 – 3, Project 690 – 1, Project 629A – 1, Project 651 – 1), two floating bases for submarines (Project 1886 floating base), and two special-purpose ships (Project 861). Total displacement of this flotilla made over 55,000 tons. Not only the Navy was losing warships, the country was losing money. According to some appraisals, with each sold large-size ship Russian armed forces lost several thousands and sometimes even millions dollars. Third, some "scrap" contracts obliged the seller to disclose specific technical details within one month after transaction. Such vessels were sold for anything but scrap. Example is seagoing cargo ship Argut. A source of RusNavy.com informed that the vessel had been decommissioned in 1996 (at the age of 6 years) and sold at the price of scrap metal, although in 2005 this vessel was carrying out commercial shipping under the name of Afiya. Both shipowner and homeport are known – AFIYA SHIPPING CO. LTD., Valletta, Malta. Formerly the second powerful and largest fleet after US Navy, in 90's Russian Navy suffered serious and practically unrecoverable damage. According to then Chief of Navy Main HQ Admiral Valentin Selivanov, in that period Russia had lost up to 85% surface ships, submarines and combat aircraft. In 1998 Karelian shipyard Avangard [Avant-garde] was turned adrift due to economic problems fell on our country again. Along with the yard, four recently laid down Project 12650 minesweepers found themselves in abeyance. Of course, the construction had been financed by government budget but the treasury had no money to subsidize work completion. Unusual decision was made towards all four ships. One minesweeper (20% completed) was utilized. Two ships (40% and 60% completed) were handed over to the shipyard's staff as reimbursement of the work done. The hulls of those ships still remain at the yard's territory. The fate of the fourth ship (95% completed) was not determined; they decided to put the matter on the shelf. To prevent the ship from "dying on berth", directors of Avangard shipyard claimed to Petrozavodsk Arbitration Court to "acknowledge the warship as a waif" with a view to finish construction and sell the vessel. However, as of 2009 the proceedings were not taken. The country loses dozens of small ships, and media reports about loss of Admiral Gorshkov. Construction of heavy nuclear-powered cruiser was started in December 1978 at Chernomorsky Shipyard in Nikolayev. In March 1982 the carrier was launched and in December 1987 commissioned into Soviet Navy. The ship was supposed to carry vertical take-off and landing aircraft (VTOL). However, during flight development tests of VTOL Yak-141 one of new aircrafts suffered breakdown. Although test pilot safely ejected, the vertical takeoff issue was shut down in Russia. Admiral Gorshkov remained idle. In February 1992 the cruiser was laid up for repairs at Sevmorput ship-repair yard in Murmansk. In 1996 it became clear that the carrier would not be overhauled. Finally, India saved Admiral Gorshkov from cruel fate of other ships written-off for scrap. 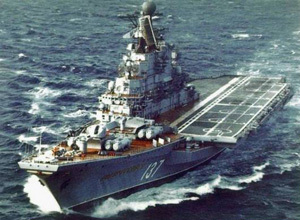 In contrast to Russia, this country needs an aircraft carrier. Talks on purchase of Russian ship by Indian Navy have had a long run. At last, in March 2010 Indian Prime Minister Manmohan Singh and his Russian counterpart Vladimir Putin unscrambled the troublesome delivery contract of modernized Russian aircraft carrier Admiral Gorshkov to India tied as early as 2004. New Delhi and Moscow disaccorded in this issue, since the price for the ship's retrofit shot up from initial $1 bln to over $2 bln. But it is critically important for India to receive the ship prior to China launches its first carrier. Therefore, New Delhi will definitely pay that $2.34 bln debt, as Moscow say. 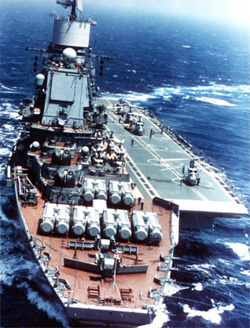 Eventually, Admiral Gorshkov will soon obtain a new name of Vikramaditya and prowl the oceans flying Indian flag. The U.S. has radically different approach to the fate of warships. Example, well-designed Essex-class carriers were successfully upgraded in postwar years so most of them had been in service for about 40 years. 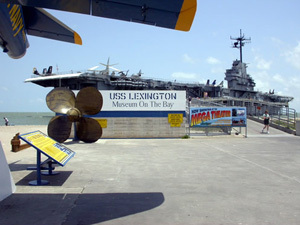 The last of them – USS Lexington – was written-off not earlier than in 1991 (only two years prior to decommission of our Novorossiysk build in 1982). By the way, Essex-class ships are the world's only heavy aircraft carriers of WW2 preserved to the present time as museums and memorials. On January 23, 2010 US Navy wrote-off nuclear submarine Los Angeles commissioned in 1976. It was initially planned that Los Angeles would be in service for 30 years. However, it was decided early 2000's to extend service life of this class of submarines. All subs of Los Angeles class – which is the world's most large-scale project of nuclear-powered submarines – will be overhauled and retrofitted. That was said in mid-November 2009 when Northrop Grumman won a $635 mln contract on technical maintenance of Los Angeles and Sea Wolf class nuclear subs. A completely different is situation around our submarines. In September 2009 Rosatom corporation declared plans to develop nuclear submarine utilization program for the period up to 2015. This program provides dismantling 191 out of 198 decommissioned nuclear-powered subs, completion of nuclear waste removal out of coastal storage bases, and utilization of laid up nuclear subs and ships. Utilization program Global Partnership is presently carried out in Russia. It should be completed in 2012. Under this program, two Russian shipyards – Zvezda in the Far East and Zvezdochka in Severodvinsk – utilize decommissioned nuclear-powered submarines for money appropriated by the U.S., Canada, Japan, and West European countries. Besides, Zvezda shipyard has recently completed implementation of Russo-Japanese utilization project concerning five nuclear submarines decommissioned from Pacific Fleet. Victor-III class subs have been dismantled in accordance with a contract signed in November 2005 between Russian and Japanese governments. The works were subsidized by Japan interested in nuclear safety at Asian-Pacific region (and in faster elimination of Russian subs, too). The question is why did they call the program implying utilization of our former military might as Star of Hope? One should not forget about Project 941 Akula nuclear-powered strategic submarines. Some of them were decommissioned in 1995 after disbandment of Division 18 based in Gremikha. Formerly powerful naval base (with attached Submarine Flotilla 11) turned into reserve base where fourty written-off subs were abandoned. 10-men maintenance crews served in each just to make sure the subs were afloat. There was no money for conversion of nuclear submarines. By the way, K-159 which sank on her way to shipyard for further utilization was from this base. Finally, dismantling works of Akulas had to be partially subsidized by foreign businessmen. Utilization of nuclear-powered submarine is a pretty expensive affair (depending on the sub's class, price varies from $7 mln to $15 mln). Dismantling of a nuc sub implies discharge of spent nuclear fuel, cutting out reactor compartment and two adjacent compartments which are then pressurized (storage time of reactor block is about 90 years). Peak compartments are also cut and sent for remelting. Considering that Akulas were the world's largest subs, their utilization required enormous money. Note, in 70's Project 941 Akula heavy nuclear-powered submarine cruisers were designed in response to Trident class US subs. However, Akulas turned out to be much larger than their competitors. 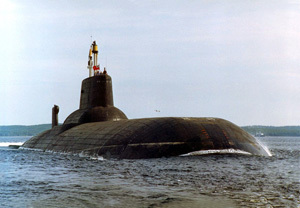 Trident sub has displacement of 18,700 tons when Akula – 49,800 tons. This is larger than displacement of aircraft carrier Admiral Gorshkov! Armament of Akula includes missile system R-19 with 20 solid-fueled 3-stage ballistic missiles with MIRV warheads. Characteristics of the sub are also impressive – length is 172 meters; beam is 23 meters; test depth is 500 meters; endurance is 120 days; crew is 179. In period of 1976-1989 six such submarines were built: TK-208 (Dmitry Donskoy), TK-202, TK-12 (Simbirsk), TK-13, TK-17 (Arkhangelsk) and TK-20 (Severstal). The seventh sub (TK-210) was dismantled being on slipways. In 2009 SSBN TK-13 (hull number 724) has become the third Akula utilized at shipyards of Severodvinsk. Previously, nuc subs 712 and 713 had been also dismantled there. Now only three Akula class submarines remain in service: Arkhangelsk, Severstal, and Dmitry Donskoy which passed capital upgrade at Sevmash shipyard to be used in tests of newest SLBM Bulava. Nowadays, warship decommissioning and sale-for-scrap rates have been notably dropped in Russia. Just because there are less and less ships remained to be written-off. "Each fleet has no more than 30-35 ships, boats, and submarines", stated Admiral Valentin Selivanov late 2009. "Just imagine, Soviet Union had built 251 nuclear submarines. There used to be 10-11 subs delivered per year. Presently, Northern and Pacific fleets have trace amount of nuclear-powered subs. There are only two diesel submarines at Northern Fleet; Baltic and Black Sea fleets have only one operable diesel sub each". Does the Star of Hope shines for Russian Navy? As for military analyst Artem Titarenko, new military leaders do everything right. For example, troublesome in maintenance ships like Project 956 Sovremenny class destroyers (they have problems with boilers) are being gradually decommissioned. 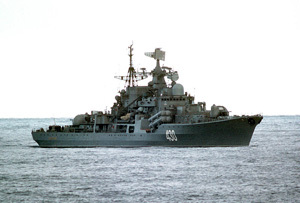 And cruisers like Kirov and Petr Veliky which positively proved themselves await modernization. "New ships are being created now, so anyways the epoch of Soviet-built ships is over. There's no need to cry", concluded Artem Titarenko.